BIG BANG Made Final in Seoul 2016. - MisTan IzZy | Travel & Lifestyle. Every VIP around the world has been waiting for this final announcement to be made officially by YG, and its finally on set with dates! 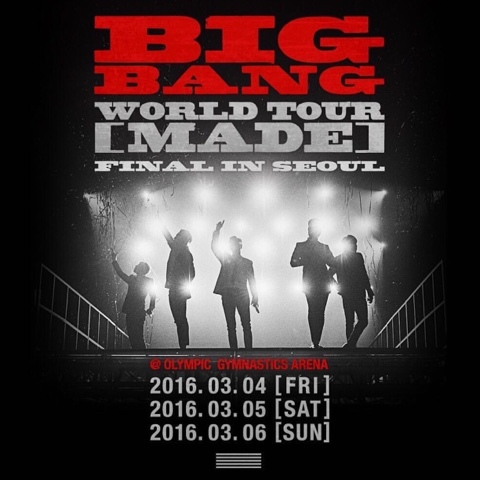 BIGBANG WORLD TOUR [MADE] FINAL IN SEOUL. If you are a fan long enough, you would have known that each and every single concert of them sold out in a split seconds, especially the one in Seoul. I ain't joking, for once we tried to purchase a ticket from GMarket in Malaysia, even with the 4G Internet Speed, I nearly couldn't believe my eyes for seeing no seat left in just 5 minutes! Previously, Big Bang's tickets are exclusively sold on GMARKET so you will not be able to find them else where unless they're bootleg or a resell. If you ever visit GMARKET, you will notice there are some sites do have a English language option however it won't allow you to purchase concert tickets because it only sell on GMARKET Korean Site. In order for you to purchase the concert tickets, you will either need a Korean Credit Card, OR you get someone in Korea to deposit money to your Gmarket account. There will be no way for you to buy it outside of Korea without the help of someone in Korea. However for this time, they have announced that ticket will be open for sales at http://ticket.auction.co.kr on 2nd February 2016, 8pm time in Korea. I believe this is the strongest comeback that ever happen, and it will remain until their return to next comeback! Once a VIP, forever a VIP. Did you succeed? I hope so. It would be a dream come true for me to see them, especially after hearing T.O.P announce that this year will be the last chance to see them together on stage for a while. I live in north Australia - couldn't see them when they were here (down south) in October 2015. What an achievement this MADE world tour is for them. I'm just so happy for their success. And for the joy they bring me every day. I wish you success in getting tickets. Thanks so much for sharing your experience and for inviting other VIPs to get Korean help. #Fighting! Hello! I've checked online that there's a sg website that sells BB tickets, is it legit or only ticket auction sells them cause I wanted to purchase them but everything is in Korean? Hi! Me and my friend are trying to get the tickets at the auction page thats on the yg page.. but is it possible to order it from Gmarket? I cant find it.. and also when were on the auction page we cant make an account because we dont have korean number and card :s Do you have any tip? hi ! just wondering how much is the ticket prices ? would make it as a basis on their 10th anniv concert this summer. ThankU ! Hi ! just wondering how much is the ticket prices ? will make it as a basis for their10t anniv . im planning to gl. ThankU ! Official price is only one KRW 110,000 however it's difficult for foreigner to purchase, buying from reseller will double or triple the original price. hi is it possible for people outside korea to buy the ticket? and do you think how much is their 10th anniv concert ticket price? It's impossible to buy it outside Korea, unless you can register an account with Korea ID no. They going to have concert at osaka japan in july 2016, can anyone help me how to purcahse their ticket? They going to have their concert in osaka japan this year july, anyone can help me to purchase the ticket ? Please please please!! Hi Donna, I have no idea how to purchase this, last time I went to their concert in Japan is by lottery way. You need a local Japanese to help on this. I am desperately trying to get 2 tickets to the seoul concert on 20th aug, already brought my air tickets and everything but buying the concert ticket is a real pain. Cant get it to work. I also need tickets to the exhibtion. Anyone can help pls.? Anyone can help on getting the tickets for Seoul concert on 20th aug.. i need to get 2. Their official tickets site is impossible to get it.